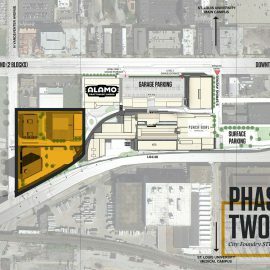 As we continue to witness demolition for parking, or worse, in Clayton, Kirkwood and elsewhere, The Loop appears to continue its trend towards becoming a dense urban neighborhood. Recent development has focused on retail and entertainment (the Moonrise Hotel, Pageant), but Washington University is now proposing the first new residential construction on Delmar in The Loop in decades. 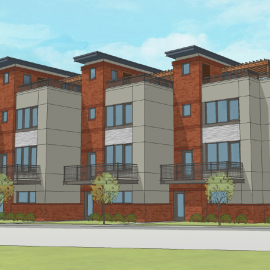 With apartments the university is calling an "innovative housing concept" for students, the project would also include 20,000 square feet of retail space. 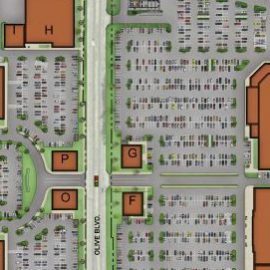 The project will significantly alter the Delmar streetscape at Eastgate. The former site of a Meineke auto repair business and past gas station. The university purchased the lot in 2008. In 2010, nextSTL covered potential development as the school surveyed students to gauge interest in living in The Loop. While the highest profile corner is currently vacant, the project seeks to demolish two residential buildings on Delmar, a commercial storefront on Eastgate and 10 residential apartment buildings on Enright. As a result, overall residential density will not be greatly increased, while the retail component will fill a hole in the Delmar streetscape. A four to six-story building would front Delmar and Eastgate, while three buildings would be built on Enright, the easternmost two of 2-3 stories and the westernmost 4-6 stories. The announcement of the project follows quickly on the heals of the Delmar Loop Area Retail Plan & Development Study, released in February. That study, commissioned by the university, found that a total of 155,000 additional retail square footage could be supported in the Loop area. On a parallel track, the Parkview Gardens neighborhood plan seeks added residential and retail density as well as better transit service (an improved Delmar MetroLink station and the addition of the Loop Trolley) and investment in parks and civic space. Both the Parkview Gardens and Loop retail study appeared more aspirational than shovel-ready just last month. 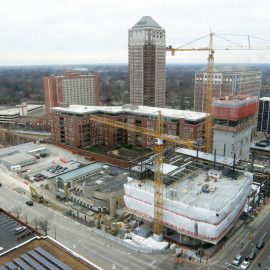 With this project set to break ground in January 2013, it becomes more likely that additional development will be announced. 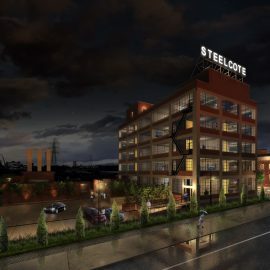 It's anticipated that private developers will move closer to breaking ground on other projects as the Loop Trolley and university investments result in a better connected, more dense neighborhood.